Who is more popular, Nokia 8, Nokia 8 Sirocco, Nokia 7 Plus or Nokia 6? Google Trends is an interesting tool that can give you insights in the interest of the public for some specific term. Of course, we can apply that to mobile phones and for example, see how popular are (were) Nokia 8, Nokia 8 Sirocco, Nokia 7 Plus and Nokia 6 (2018). The only surprise was to see that 10 days after the MWC2018, and the presentation of Nokia 8 Sirocco, the original Nokia 8 is still more popular than its classy version. Actually, Sirocco raised the general awareness of the regular 8, but later on (after MWC has passed) we see that the original is still very popular, and the interest in Sirocco is in slight decline. This will definitely change when HMD starts sending devices for a test and tech portals start writing about it more. Everything else is like I thought it would be. Nokia 6 is the most searched phone, but the original version contributed significantly to this. But, we gotta be honest, the original one was a success since it is carefully designed, and its latest version is a real improvement. 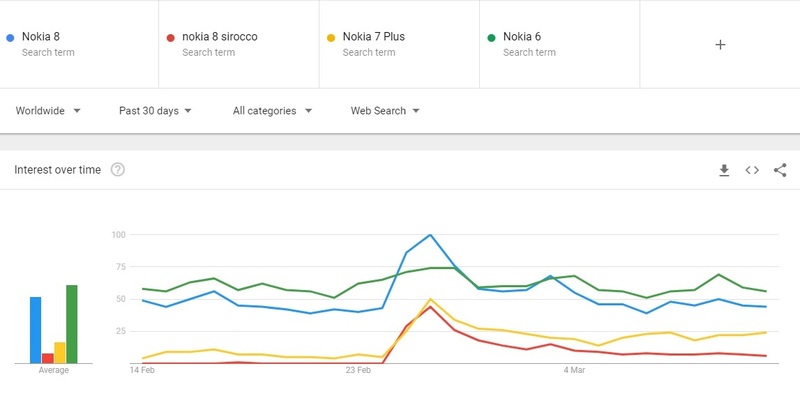 Nokia 7 Plus, my personal winner of the MWC2018, is searched more (we could correlate this with popularity) than Nokia 8 Sirocco, which many people expected to be a flagship model. Nokia 7 Plus definitely brings more for the price, and could easily achieve very good sales results. We saw that the Chinese are quite interested in it and the rest of the world could be also. The Google trends tool can’t be used as a prediction tool since it can be interpreted in many ways, but for sure can show a current interest of the people. For example, we can see how great marketing tool Nokia 8110 4G actually is, or nostalgia to be correct. But, when we compared it with last year’s Nokia 3310, HMD will have to do more for next MWC. Maybe a modern version of Communicator isn’t such a bad idea. 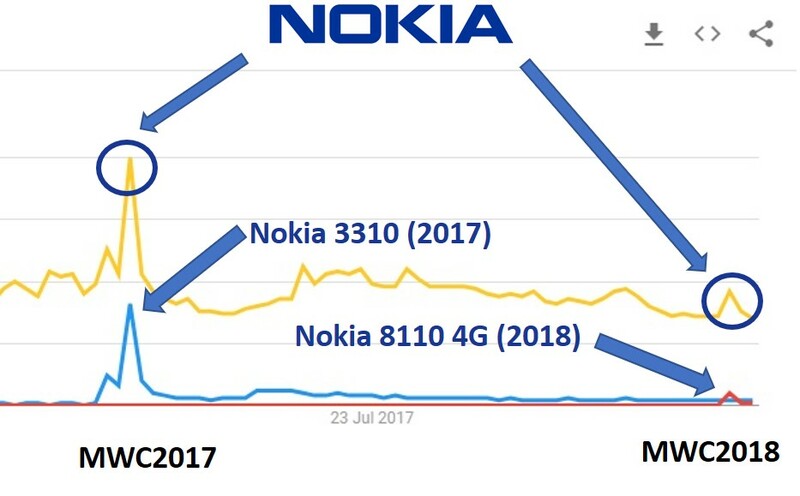 Additionally, you can see how Nokia profits from these phones, and also why is this deal important for the company, and for its brand. If you wanna play with Google trends, just hit the link.